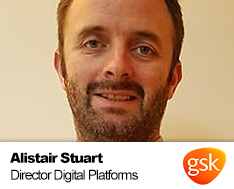 Alistair has worked for over 16 years in Research and Development roles across the pharmaceutical and technology industries including at GlaxoSmithKline, Takeda and several start-ups focused on bringing technology solutions to healthcare. In 2015 he completed an MBA at London Business School where he gained concentrations in Marketing and Finance. It was during his time at London Business School that he discovered the nascent digital healthcare scene in London, working with an online doctor’s service, the commercial arm of Cancer Research UK and for a mHealth consultancy. He also worked with a charity working to build a voice for street children and with a low-carbon social enterprise on innovative solutions for social housing. Most recently, Alistair worked as Operations Director at uMotif, a London-based startup working with the NHS, US healthcare institutions and UK patient groups on a platform to support patients and capture patient-generated health data. Alistair has been known to run half-marathons and recently completed a Tough Mudder challenge for charity.